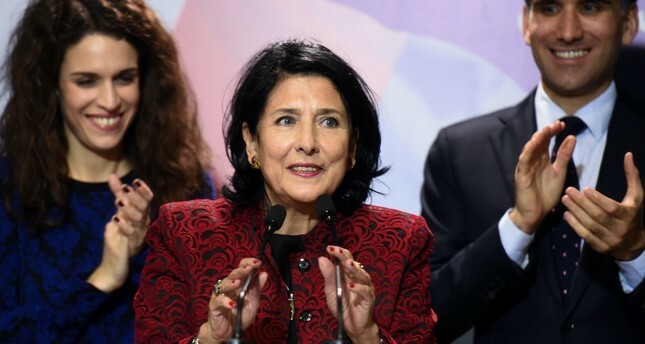 Before being elected Georgia’s first female president Salome Zurabishvili, addresses the media in Tbilisi during her election campaign, Nov. 28, 2018. While the war in Syria ravages Turkey's southern neighbor, Georgia, its Caucasian neighbor, continues its pursuit to become a stable democracy and growing market economy. In Georgia, 2018 was marked by presidential elections and the coming into force a new constitution to change the governance system. In line with this, Georgia became a parliamentarian republic with substantially broadened authority of the prime minister and reduced presidential power. The transformation is bound to contribute to Georgia's further democracy building in compliance with the EU standards and recommendations, bringing it closer to EU integration. Fifteen years ago, the Rose Revolution in Georgia provided an opening for major democratic and economic reforms. The launched process continued gaining momentum until 2007 and produced deep and far-reaching transformations for life in the country; but slowed after 2007, triggering a change of power in 2012 and the Georgian Dream party won the election. The transformation going on today, important as it is, fails to eclipse the election of Salome Zurabishvili – the country's president to become the first female at the helm of power in Georgia. An independent candidate supported by the Georgian Dream ruling party, she won close to 60 percent of the vote in the elections' second round on Nov. 28 and on Dec. 16 took office as the next president of Georgia for a six-year term. The foreign minister under President Mikheil Saakashvili, French-born Salome Zurabishvili is a different type of Georgian leader. She is a career diplomat with 30 years of experience in the French foreign service, who took up residence in Georgia shortly after its independence. Born into a family of the famed Georgian nobility who immigrated to France in the 1920s, she is a Westerner without the legacy of a Soviet background, which alone makes her different from the ruling elite of the post-Soviet nations. While the president's office is now less powerful than that of prime minister, particularly in the matters of domestic policy, Zurabishvili is expected to play an influential role in Georgia's foreign policy considering her rich diplomatic background. From its early days of independence, Georgia has acknowledged its U.S. orientation and its aspirations of joining NATO and the European Union. Zurabishvili didn't waste time in acknowledging closer ties with the EU and NATO as Georgia's foreign policy priorities and further EU integration in particular. She made Brussels the address of her first foreign visit that took place Jan. 21-23. Stressing the importance of the visit, Zurabishvili called it a "clear and symbolic gesture" that reflects Georgia's indisputable priorities envisaged by its constitution that came into force straight after her election. These priorities are integration into Europe where Georgia belongs by its culture, spirit and identity, she believes. "Georgia feels at home here," summed-up Salome Zurabishvili in Brussels. Speaking with Daily Sabah, Sofio Katsarava, the chairperson of foreign relations committee of the Georgian Parliament, said, "President Zourabichvili's first visit to Brussels in her new capacity yet again stresses the symbolic and political importance of Georgia's foreign policy priorities," and added, "The visit was a success; all high-ranking EU officials yet again expressed their staunch support to Georgia." "European and NATO integration is our main foreign policy priority," Katsarava stressed. "And this generates strong support for the majority of the Georgian public, each time attested by elections, when the Georgian people choose to vote for the pro-Western political parties". Today's Georgia is an example of positive regional cooperation and it considers economy, trade and joint infrastructure projects to be the pillars of this process. In practical terms, Georgia's EU integration is reflected by engagement in building through its territory a transportation corridor to Europe, which has gained an increasing momentum since its independence. The country is evolving as a prime transit route for hydrocarbons from Central Asia and the Caspian, and miscellaneous goods from Asia and the Middle East to the world markets. Today, Georgia has secured its solid place in projects of global dimension, such as the new Silk Road, the transportation of oil and gas to the world consumers and railroad communication between Asia and Europe. The start was made in 2006 with the commissioning of the Baku-Tbilisi-Ceyhan pipeline (BTC) to deliver, by passing through Georgia, Caspian crude to Turkey and further to the world markets. It was followed by the South Caucasus Pipeline (SCP) that, in 2007, started pumping natural gas from the Shah Deniz gas field in Azerbaijan's sector of the Caspian Sea to Turkey by going through Georgia. One of the most recent important results of Georgia's cooperation is the Southern Gas Corridor (SGC) crossing the South Caucasus and Turkey for delivering natural gas to Europe from Azerbaijan and at a later stage potentially from Iran, Iraqi Kurdistan, the Eastern Mediterranean and even Turkmenistan. Its longest section, the Trans-Anatolian Pipeline (TANAP), became operational in August 2018 to start annually pumping 10 billion cubic meters of Azeri gas to Turkey. The commissioning of the Baku-Tbilisi-Kars (BTK) railway in October 2017 contributes as well to building Georgia's potential of a gateway from East to West. As of October 2018, a total of 110,000 tons of goods have been transported by the BTK since its opening. Beneficial as it is for Europe and Asia, the railway bears potential for Russian-made goods, as well. This is due to the BTK's geographic location paired with Russia's impressive production capacities and its export market strongly oriented at the countries of the Middle East and Southern Europe. Likewise, the Russian market is a traditional supplier of goods to Caucasian countries, which adds more value to the BTK. Construction of the Anaklia seaport, the deepest port in that part of the Black Sea, is to be completed soon to make it a hub for the world largest container carrying vessels. The port will provide new transportation opportunities for the fast-growing economies of China and India and enable unimpeded delivery, particularly of high-value added goods, to European consumers. According to Georgia's Economy and Sustainable Development Ministry, around $5 billion are set to be invested in Georgian infrastructure projects by 2020; while the European Union alone has pledged to allocate 3.4 billion euros ($3.86 billion). All in all, 98 major projects to total 13 billion euros are due to be completed by 2030. Among them are for the construction and rehabilitation of around 4,800 kilometers of highways and railroads, six seaports, 11 logistic centers, airports and border crossing facilities. Georgia's location on Black Sea shores and its neighboring Turkey and Russia impact its political priorities, alliances and course of national development. Georgia is not just another neighbor for Turkey. Since the early days of Georgia's independence, the two countries continue to build robust diplomatic and commercial ties through such bilateral initiatives as the Turkey-Georgia High-Level Strategic Cooperation Council. Besides being a lucrative market for Turkish goods and services, Georgia enjoys a joint historic and cultural heritage with Turkey that contributes to continuously growing tourism exchanges. "Turkey is our strategic and number-one trade partner," said Katsarava. "Turkey, Georgia and Azerbaijan are engaged jointly in a number of strategic projects. These are infrastructure, pipeline and railroad projects. We are committed to continue this cooperation and partnership with Turkey and Azerbaijan, both bilaterally and multilaterally. As well, the foreign affairs committees of our countries actively promote these ties by means of the trilateral parliamentary format." Relations with Russia are a sensitive issue for Georgia. Following the August 2008 war, when Georgia lost Abkhazia and South Ossetia, they became sharply strained and have hardly improved since then. "Russia occupies 20 percent of our territory and it's the biggest security challenge that Georgia is facing," stressed Katsarava. "We, however, continue building stability and security in the country and contribute to security in the wider region. We have our red lines when it comes to the occupied territories and the conflict with Russia remains high on our international agenda. At the same time, we adhere to a clear peace policy towards those who live on the occupied territories. Peace and stability in Georgia and the region have no alternative, as we have ambitious plans to continue the path of progress and development." Still and in terms of geography, Georgia and Russia remain immediate neighbors, not to mention the historic and economic ties and regional stability matters. Let's hope, this will inspire the countries to mend their interstate relations sooner or later. After taking office, Zurabishvili hasn't hesitated in revealing her skepticism about making up with Russia by saying that the time hasn't come yet; though, she revealed a hope of becoming a "president of reconciliation." Let's hope it's the light at the end of the tunnel.